The authors emphasize that the Republic of Kazakhstan is characterized by significant differences in the level of innovation capacity of regions. This article summarizes that the result of the monitoring of innovation potential of the regions are prerequisites for innovation policy adjustments, make it more dynamic, which ultimately contributes to its effectiveness. So, there are substantial differences in the level of innovation potential of the regions in the Republic of Kazakhstan, meanwhile it is noted that most regions’innovative features and potential can be assessed as average. 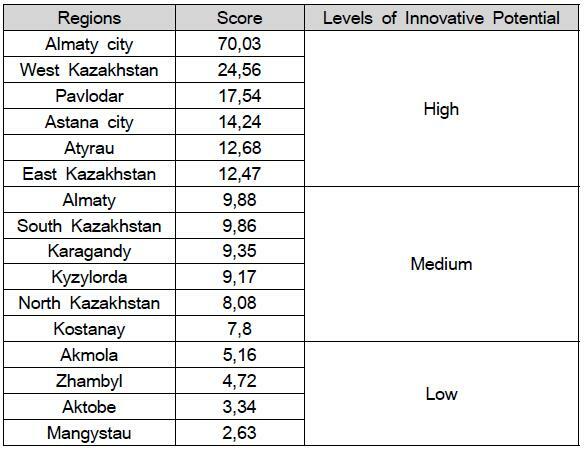 After analysis of previously used methods, it can be concluded that the ranking of the level of innovation potential of regions takes place in the following order: High level of innovative potential: East Kazakhstan (3 matches), Almaty city (2 matches), Pavlodar (2 matches) and Zhambyl regions (2 matches); Low level of innovative potential: Almaty (2 matches), Mangistau (2 matches), West Kazakhstan (2 matches), Kyzylorda oblast (2 matches). In conclusion, it is emphasized that monitoring of innovative potential of regions creates the preconditions for innovation policy adjustments. These adjustments make the policy more dynamic and contribute to its effectiveness in the long run. JEL Classifications: O31, R11, R12. Key Words : Innovative Potential, Innovation Capacity of Regions, Innovation Policy. In order to implement the state programs effectively within the framework of industrial-innovative development of Kazakhstan – it is necessary to identify the potential of each region in the country. Innovative development programs increase the interest of regions in creating a favorable climate for innovation and their responsibility for the implementation of this process. Therefore, an objective assessment of the innovative potential of the region, as well as the parameters and characteristics of its innovative capacity are of particular importance especially during making economic, technical and social solutions of the region's development. In other words, the dire need to use the innovative potential of the region arises based on its size, structure, characteristics, load level and efficiency of return as an object of managment. According to the estimates of western economists, above mentioned methods allow to assess the state of innovation in the analyzed countries, to trace the dynamics of changeof innovative activity, to analyze the strengths and weaknesses of individual regions and make a conclusion about the degree of difference between them. •Assessment based on the formation of a regional innovative system (RIS). Under the latter approach the method of express diagnosis of innovative activity in the region proposed by A. B. Pushkarenko and L.V. Vesnina can be applied (Pushkarenko, 2011; Vesnina & Chuchalin, 2011). The authors’ techniques allow to perform basic and special functions of potential management. Also as part of this approach - calculation the total regional innovation index (Maastricht Economic Research Institute on Innovation and Technology MERIT), structural analysis technique of innovation activity areas (S.V. Krotov) (Vesnina & Chuchalin, 2011), a technique of region positioning (A. E. Warsaw) (Varshavsky, 2004) and methods of integrated assessment of scientific and technical potential of the region (Tropinina, 2004) are used. 5) Forecast efficiency to create structures that support innovation. •Modeling of the dynamics of innovation implementation. 1) Scientific and technical groundwork of personal and acquired developments and inventions. 2) The state of infrastructural capacity of industrial enterprises, scientific and technical organizations in the region to ensure the passage of invention in all stages of the innovation cycle and turning it into a novelty or innovation. 3) External and internal factors that reflect the interaction of innovative potential with other parts of the aggregate capacity of the region and that influence the success of the innovation cycle. 4) The level of innovation culture that characterizes the willingness and ability of enterprises in the region to implement novelties in the form of innovation. •As a result indicators - the proportion of organizations engaged in technological innovation, the total number of organizations, the volume of innovative products of the total volume of goods shipped. 1) The strategy of regional specialization in the field of development of certain areas of innovation. 2) The features of offered innovative products. 3) The range and assortment of innovative products and services offered within the analyzed activities. 4) Unused channels of distribution of innovative products in the interregional space. 5) Promotion features of regional innovation products. •The volume of innovative products and services in relation to GRP. 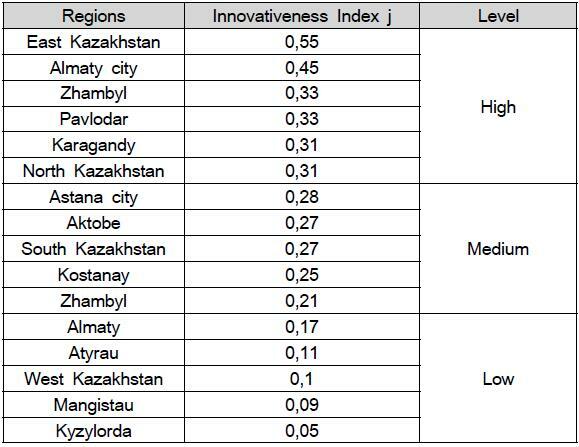 Thus, according to this method, the highest index of innovativeness belongs to the East Kazakhstan oblast and Almaty city, and the lowest index of innovativeness belongs to Kyzylorda region. The method of professor O.V. Kuur is quite relevant in order to assess Kazakhstan regions’ innovative potential. The author of the method "The rating of the innovative potential of the regions of Kazakhstan" offers techniques and ways to apply a set of indicators characterizing its individual components (Kuur,2010). The difficulty is to bring these indicators to the same view, as this is not possible without the integral evaluation of innovative potential. V.O. Kuur notes that the level of innovative activity of regions depends on the innovation potential, which they have and the characteristics of their infrastructure. In turn, there is a reverse effect of innovative activity of economic entities on the region and its innovative potential. In this regard, it is reasonable to determine the dependence of the innovation potential of regions against the indicators of innovation activity of its economic actors. 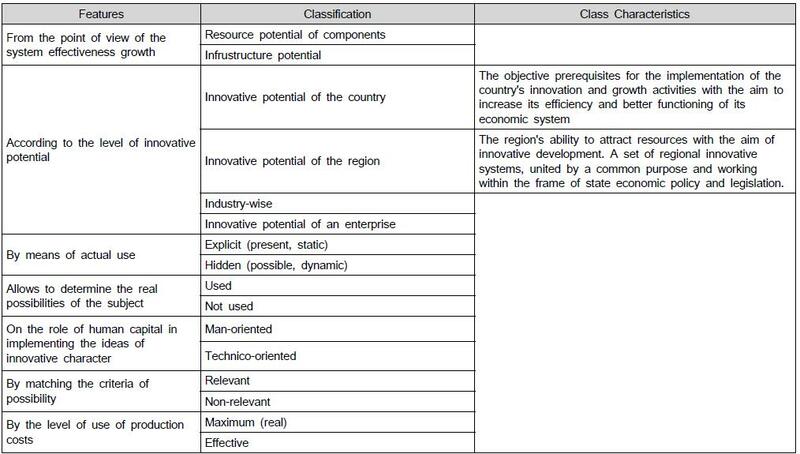 Given the fact that the end result of the economic activities of the regions (provinces) is the gross regional product, the innovation potential assessment should be based on building a model of GRP depending on the performance of innovation enterprises. Among these indicators, in our opinion, are the following: the number of innovative companies and organizations, the number of received patents for inventions; expenditure on technological innovation, the volume of newly introduced and improved product innovations, investments in fixed assets, the cost of fixed assets; employment in the field of innovation etc. Based on multivariate correlation-regression analysis, calculation and trying different models we have been able to identify and justify the equation satisfying the criteria according to the gross regional product of the system of indicators for innovative activity regions of Kazakhstan. X5－number of employed, thousands of people. A high level of correlation coefficient approaching a unit (R=0,83) indicates a close connection between the identified factors and gross regional product. The resulting model was the basis for assessing the level of innovative potential areas of the Republic of Kazakhstan and the subsequent ranking on this criterion. In determining the level of innovation in integral form, we used the technique of rating analysis based on the calculation of standardized coefficients. The technique is as follows. At the first stage the best indicator (i.e that which has the greatest value) among the regions the maximum value – 1 is assigned, with respect to which fractions of unit value indices of other regions are calculated. This approach allows us to balance the values ​​of the analyzed parameters and lead them to a comparable form. In a second step, the obtained values ​​are squared. But since the importance of indicators in the regression equation is different - at the third stage we felt it was necessary to calculate the weight of each indicator for the extent of its impact on the GRP and use the weights (multiplying them by the corresponding standardized coefficients calculated in the second stage). This allows to determine the weighted average of the levels of innovation potential in concerned regions. •High innovative potential: Almaty city, Astana city, East Kazakhstan, West Kazakhstan, Pavlodar, Atyrau regions and oblasts. So, there are substantial differences in the level of innovative potential of the regions in the Republic of Kazakhstan, meanwhile it is noted that most regions’innovative features and potential can be assessed as average. It is emphasized that monitoring of innovative potential of regions creates the preconditions for innovation policy adjustments. •High level: East Kazakhstan, Aktobe, Zhambyl, South Kazakhstan, Mangistau regions. So, there are substantial differences in the level of innovation potential of the regions in the Republic of Kazakhstan, meanwhile it is noted that most regions’innovative features and potential can be assessed as average. •Low level of innovative potential: Almaty (2 matches), Mangistau (2 matches), West Kazakhstan (2 matches), Kyzylorda oblast (2 matches). In conclusion, it is emphasized that monitoring of innovative potential of regions creates the preconditions for innovation policy adjustments. These adjustments make the policy more dynamic and contribute to its effectiveness in the long run. Khalimova, S.R. (2011). Innovative activities of Russian regions. Analysis of the development of regional innovation systems. - Saarbrucken: LAP Lambert Academic Pub., 2011. - 116. Kuur, O.V. (2010). The rating of the innovative potential of the regions of Kazakhstan. http://www.rusnauka.com 15APSN 2010/Economics/67137.doc.htm. Pushkarenko, A. B. (2011). Analysis of innovative development of regions - members of the Association of Innovative Regions of Russia. Regional Economics: Theory and Practice. 22 (205) June. Repchenko, N.A., & Fokin, O.M. (2007). Evaluation of investment attractiveness of the region, taking into account innovation and the fiscal capacity of the region//Innovations, 2007. - № 7. - p. 64-66. Samarukha, V.I., Krasnov, T.G., & Plotnikova, T. N. (2001). Methods of assessing the potential of the development of innovative programs at the regional level// http://cyberleninka.ru/article/n/ metodika-otsenki-potentsialnyh - vozmozhnostey - razvitiya - innovatsionnyh - programm - na-regionalnom-urovne. - 20011 4 s.
Tropinina, N.E. (2004). Methodical approach to assessing the scientific and technical potential of the region: abstract on scientific degree of candidate of economic sciences. - Pb 2004. Varshavsky, A.E. (2004). Innovation Management in Russia (the problems of strategic management and scientific and technological safety). - Moscow: Nauka, 2004. Vesnina, L.V., Chuchalin A.I. (2011). Formation of training system for the development of knowledge-based sectors of the economy through a consortium of universities and research organizations. Vestnik of Tomsk State Pedagogical University. - № 10. - 2011.